The southward journey continued, this time towards Mackay. That is, after we did a short loop back into Townsville to pick up a package that I had had shipped to me and had forgotten to pick up when we were in town. We stopped by a bird hide for lunch. This colorful guy kept flitting around trying to get his own lunch. This little bird might be my favorite in all of Australia. While not as colorful as other birds, it has a very fancy walk/dance that it does. One of these days I hope to record it for you. I find it very entertaining. I wanted another chance to see a platypus, so we headed towards Eungella NP. There is a Platypus Walk there with several viewing platforms. Our timing was poor, though, so all we saw were a snake and some turtles. I believe this is a saw-shelled turtle. I think this is a harmless common tree snake. Was a bit of a concern, though, when it started moving towards on the path. Apparently, it just wanted to take shelter under the boardwalk. Native bees! See how tiny they are?! Our first encounter with them was on our windshield. They would land on our windshield while we were driving and hold on for a while before flying off. I was super confused by them. Eventually I learned they were native bees. I have wanted to show them to you for a while now, but was never able to get a picture. Next was the coast again. Andrew’s point. Wedge Island, which is connected by a land bridge at low tide. My favorite part of the walk was Turtle Lookout. We must have seen 20 turtles pop up for breath just offshore while we were watching. As we worked our way south, we stopped at Byfield National park. The roads to the supposedly-stunningly-beautiful coast involved crossing a few bare dunes, so that was out. Instead, we opted to kayak up a river for few kilometers. Surrounded by the coastal rainforest, the calm water reflected the canopy. Despite our best efforts we managed to scare off most of the snakes. Side channels were surrounded by tall palm trees. many leaning out over the water. We spied a kingfisher (relative of the kookaburra) waiting for a meal. In many places we had to navigate over, around, or under fallen trees (something Jen really delighted in). A number of aquatic and semi-aquatic reptiles were hiding in plain sight. This one was taking a break next to a rock. It was at least 20 inches long. We passed through Rockhampton, the cattle capital of Queensland. Over 2 million cattle live within a few hundred kilometers of the city. We stopped at the excellent city gardens, particularly for the free zoo. A number of unique birds were about, both inside, and outside the aviary. This little guy was stealing some of the Cassowary feed. Oriental ducks, check out that plumage. This is a lace monitor (named for its scale pattern). She probably weighs at least 20lbs. This is what Koalas do most of the time, nap. Often more than 14 hours a day. We headed inland a bit to Blackdown Tablelands. Named for its location, this NP is located on a high mesa. One of the reasons we continued down to the Head of Bight after driving through Coober Pedy was the fact that I couldn’t guarantee that we would be able to see whales at the other locations, especially if we went up into Cape York. However, since we bypassed Cape York, we were actually going to arrive at Hervey Bay while there were still potential sightings of humpback whales in Platypus Bay (near Fraser Island). They don't guarantee sightings after the second week of October, we would be there during the first week. So, we started making our way towards Hervey Bay, with excitement that we would have a chance to see more whales. First off, though, was Bundaberg. This place is famous for 2 things: rum and ginger beer. We thought about doing the rum distillery tour, but it seemed it was really expensive ($100+) and may or may not include a tour of the actual facilities. Plus, neither of us particularly enjoy alcohol, so we decided against it. 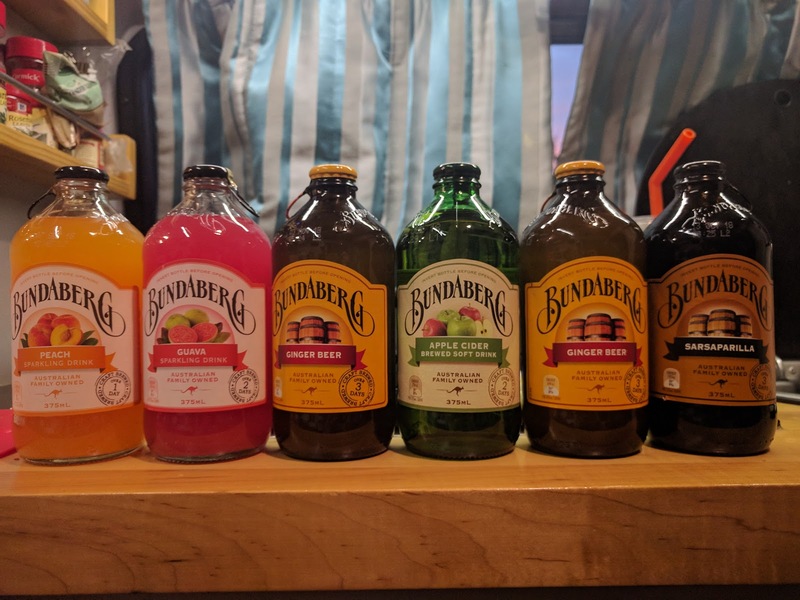 However, the Bundaberg Ginger Beer facility had an inexpensive self-guided tour that I thought could be interesting, so we decided to check it out. As part of the tour, we discovered that ginger beer was actually made by fermenting yeast, just like beer, but they add a heating process to it afterwards to remove all the alcohol. Additionally, if you have ever wondered what the difference is between ginger ale and ginger beer, it is that ginger ale is carbonated (like a regular fountain drink), while ginger beer is brewed (like alcohol). There was a tasting of all their flavors afterwards. I tried a sample or two, but was reminded again why I really don’t like anything but water or juice. Jonathan tried them all, which made him feel a bit weird, after having so much sugary drink in a while without any food with it. At the botanic gardens, tons of ibises were nesting! The Bundaberg Ginger Beer visitor center was built in the shape of a wine barrel! The flavors Jonathan decided were worth bringing back with us. Next, then, was Hervey Bay. We booked a half-day tour through Hervey Bay Boat Club Adventures, which was the cheapest option. While being less costly, it still offered much of the same conveniences of the other tours, including a hydrophone, tea, and snacks; it did NOT include any underwater viewing options. It did take about an hour to get out to Platypus Bay, which means it also took an hour to get back after leaving it, so it might be one of the slower tours. We encountered our first whales shortly after entering the bay. It was a mother/calf pair, which is pretty typical for the bay this late in the season. Most of the males and single females have already ventured further south by this time. The calf started feeding and they stopped moving, so we moved on. Anyone else think it looks less like a “hump” and more like a deformed fin? I feel deceived. Our second sighting of whales was another mother/calf pair, but accompanied by a male. This calf was feeding as well, but finished shortly. Then it had tons of energy and went about breaching and jumping and generally showing off for us. It kept rotating as it jumped, so I got several angles. The male, too, was swimming nearby and singing to the female. He would come and go, diving deep, and one time even went under the boat while the mother and calf passed in front of us. It was a sight to behold. Occasionally, we would even hear the whale song without the use of the hydrophone. The tune vibrating up through the boat. It was truly something else! Apparently the male will sing the same song all year long and then switch it up the next year. All 3 of them right next to boat. Whale Song. It does sound a bit like Dory’s impression. Apparently only males sing, though. At one point, we thought things had calmed down and he was going to feed for a while, so we left, only to have to turn back again and return when the calf started exercising again. They were super close to the boat. Finally when they had quieted down a second time, we spotted two whales communicating to each other via fin slaps (quite some distance apart). We tried to get closer, but once we arrived the slapping mostly stopped. Needing to get on with our tour so that we weren’t late in getting back, our captain started piloting us towards Fraser Island. We saw dolphins and turtles and other non-active whales on the way. And got a pretty close view of the largest sand island in the world. You can even see a whale surfacing there on the left! So, what did I think of the experience? I loved seeing the whales! I did wish it was a breeding ground, though, as seeing the adults do what the calves did would have been awesome. Also, I always pictured humpback whales as gray. Apparently they are black. There are 2 versions: Northern and Southern. The main difference is that the Southern Humpback whales have white undersides, while the Northern ones are all black. The last three capital cities we have to visit are Sydney, Brisbane, and Canberra. First on our southerly route is Brisbane, the capital of Queensland. On our way to Brisbane we stopped by Rainbow beach, just south of Frasier Island. For those wondering why we bypassed Frasier Island (avoided really), it is due to the crowds (over a thousand arrive per day in some cases). The rampant bogan (roughly translates to redneck) 4x4 drivers also put us off, we met a few of them near the ferry departure points, and were not impressed. Finally, Frasier is mostly more of what we have already spent weeks enjoying, rainforests and beaches. Due to the sandy bottom, the ocean surrounding Frasier has no reefs, and is pretty empty (aside from the migrating whales). So in the end, we opted to avoid paying hundreds of dollars each for the privilege to being trucked about on sandy 4x4 tracks with hundreds of other tourists. We weren’t able to find the rainbow in “Rainbow Beach”. Climbing the enormous dunes made up for it, though. It's hard to get a sense of the scale, but these sand dunes are hundreds of feet high, and drop down right to the beach. Only a thin layer of forest colonizing the surface keeps these dunes from drifting inland and burying the town and farmland behind. Continuing towards Brisbane (locals pronounce it Bris-bin), we detoured into the Glasshouse Mountains. These peaks started life as magma intrusions into the surrounding sedimentary rock millions of years ago. The surrounding rock has eroded away over the eons, leaving the tough basalt behind. Brisbane is a modern metropolis by the sea. With a mild sub-tropical climate and ringed by parks and wild lands, it is easy to see why millions of Australians call it home. Of course, don’t ask anyone about housing costs, you might not get away unscathed. We opted to do a one-day tour of Brisbane’s Central Business District. There were no convenient places to leave the van and ride the trains for a multi-day visit. The CBD is a eclectic mix of modern high-rises and hundred-year-old stone and brick buildings. We started our tour at City Hall. A testament to the wealth and prosperity of the city, it was built in the 30s, with its 85-meter clock tower, when the surrounds were nothing but docklands, and empty fields. They don’t do things in half measures here. The building was designed to host visiting politicians and foreign dignitaries, as well as a hub for local activity. At the time, Brisbane was very remote, only accessible by sea, or the long rough road from Sydney and Melbourne. Note the Corinthian columns. We also got a chance to climb the clock tower, and visit the in-house museum. Check out that banquet hall! The huge domed ceiling is intense. The plasterwork makes my neck hurt just thinking of it. We continued on to visit the Gallery of Modern Art across the river. Brisbane is situated on the mouth of river Brisbane. As such, the CBD is built right up against its banks. Bridges, roads, parks, and the swankiest apartments line and crisscross it. My new camera only takes AA batteries. This isn’t ideal, as I take a lot of photos and use the bluetooth function, so the batteries are dead just after a few days. So, we ordered some new lithium rechargeable ones to use. However, I didn’t send them to a post office far enough south for our timeline, and we needed to burn some days in the area until the package arrived. That was ok, though. It gave me a great excuse to have Jonathan take me a Japanese garden in Toowoomba. I must give credit to the Japanese; they know how to design a garden. Not only are they beautiful, but they are peaceful. Made me want to have one! From there, we went south to Girraween National Park. This place is known for its flowers, with supposedly 6 months of natural flower displays. Somehow, we arrived in that 6 months, but during a time when there were only a few flowers blooming. Our first walk was to the underground creek, where we found lots of dragons, lizards, and skinks living the good life on the rocks. The ubiquitous superb fairy wren along the path. Then, the next day, we did a circuit that included Granite Arch, The Pyramid, and Wyberba walking trails. I must say, there is just something about granite that makes it very fun to experience in nature. The boulders, the worn pathways for water, the bald peaks. They all just make me inexplicably happy. Granite arch. While it looks like a giant was playing with rocks, the 3 rocks used to be on large rock. Check out that slope we were traversing! This little skink made his home in a layer of bark. Sure looked like a snake for a minute, though! FUN FACT: If you have been reading the “By the Numbers” posts, you have noticed that some states provide plastic bags at stores for free, others charge. Despite Tasmania and South Australia requiring the use of reusable bags, we had so many bags by the time we reached Broome, that we decided to use reusable bags for a while until we ran out. They don’t really have very many recycling places for plastic bags here, so I didn’t want to be wasteful. Well, we finally ran out. From the beginning of June until about halfway through October, we did not need to obtain any plastic bags. We really only use them as trash bags, and only generate about 2-4 bags per week of trash. Now, we will only get bags from the store when need more bags for trash. By visiting some locations farther inland, we had burned enough time to be able to pick up my package of batteries from the post office. After that, I wanted to give Jonathan a taste of the Gold Coast. When I came to Australia before (freshman in high school, which is 16 years ago now) with my friend who was here for a golfing tour, we spent most of our time in the vicinity of the Gold Coast. Sure enough, as we traversed the streets to reach the coast, I was flooded with memories from that time. The city isn’t really the type of place Jonathan and I enjoy, but it is worth visiting just to see what other tourists experience. This is pretty much what the coast looks like from Brisbane to the border with New South Whales. Just the driving through town to the coast was enough to make us want to flee to the countryside via the fastest route. So we made a beeline to Springbrook National Park, but upon arriving, found the road blocked. A quick google showed that there were other entrances, so we started heading towards those. However, on the way, I was trying to book a campsite to stay that night and discovered that Springbrook’s campsites were all full (it was the weekend). I did find that the next park over, Lamington NP, had spots open. So, instead, we went to it. The drive was a bit longer than we expected as we had to drive up steep hills (alternating one-lane roads) through thick forest in the rain (it is a rainforest). But, we got there and got settled in and decided to walk Moran Falls track. The pademelons were out in full force after the rain, chomping down on the grass. On the way back, we stopped at a place where there was a trickle of water and endeavored to find a tree frog we heard. Instead, Jonathan spotted a large blue and white cray hiding in a hole under the path! I tried to get a picture of it, but it was too far in the hole and too dark. It was pretty massive, though. The next day, I had planned on doing West Canungra Creek Circuit, but upon passing the info centre, found out that the path was closed. Instead, we decided to walk part of the Toolona Creek walk. This is a brush box tree, leftover from when it was cooler and drier. They are dying out in the region because of the climate has changed. These giants are at least 1500 years old. At Picnic Rock, we found a smaller version of the blue crays! As well as an eel! Then right next to the path, I spotted this red-bellied black snake. Pretty sure these can kill you. Jonathan and 2 other hikers walked about a meter from it without noticing and then I saw it. This picture actually has 2 medium-sized crays in it. They are fighting over who gets to hide in the water under the leaves. While I was endeavoring to get some awesome photos of this pair, I suddenly realized that about 20 leeches were crawling towards on the small rock that I was on. It had started raining shortly before and being next to the river, they were coming out in droves. I quickly decided that getting those pictures were not worth being lunch to these blood-sucking creatures and decided to keep going on the path. However, despite getting farther from the river, the leeches kept coming (though not in as large groups). Between the rain and the leeches, we decided it was too miserable to keep going, so we decided to head back the way we had come. I only wish I had stopped long enough to get a picture of all the leeches that were coming at us! Fortunately, by the time we had gotten back to Picnic Rock, the leeches had stopped and we were able to enjoy a more leisurely walk. Unfortunately, my camera batteries died. The lithium ones last a lot longer, but they don’t give me any warning before they die. 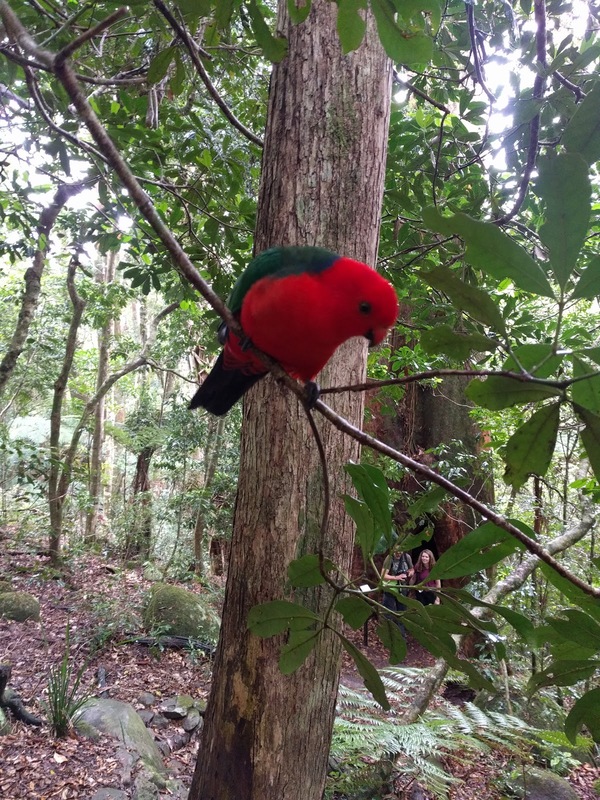 There wasn’t too much to take a picture of before we got back, except for this elusive King Parrot. He had been tagged, so we assume he was used to people and being fed. He actually let us get quite close to him. King Parrot, looking like he wants a snack. FUN FACT: Until a month before this (late September), I had thought that Australia didn’t believe in cornmeal, and thus, cornbread. Turns out that they may not quite believe in those, but they do have something that works. Apparently “polenta” is made from corn as well. The difference between cornmeal and polenta is the coarseness of the grind. Polenta is a coarse grind; cornmeal is medium. I found this news very exciting, as I love me some cornbread. It makes a great cheap meal when you combine it with beans. After 8 months in this country, we were finally able to have some cornbread! The polenta definitely worked, now I just have to figure out how to cook it in my toaster oven without burning it, which I think I am finally getting an idea of how to do that.